The 120 mm Alphacool Eiszyklon RGB fan combines silent operation, high performance and great aesthetics to create a fan suitable for a wide range of users. 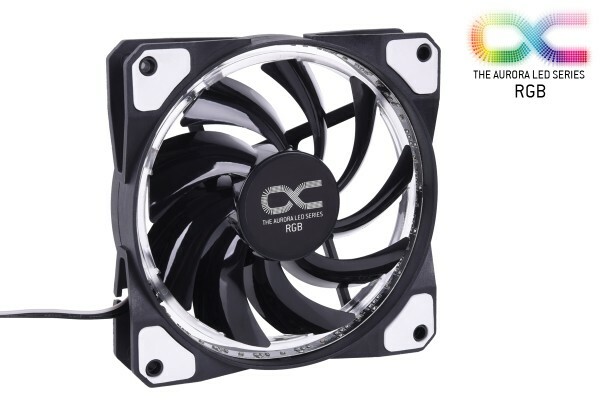 Due to its high air flow rate and enormous static pressure, the 120 mm Eiszyklon RGB fan is suitable for use on radiators, CPU air coolers and as a case fan. The 120mm Eiszyklon RGB fan has a maximum RPM of 1100rpm, a perfect balance between performance and noise. Instead of just 4 LEDs in the corners of the fan frame, like you would see with many other fans, Alphacool uses 21 RGB LEDs. These are mounted inside the frame and light up directly on a ring diffuser attached to the end of the fan blades. This produces the laser beam effect. The light is reflected on the shiny black fan blades and are static. This means that no matter how high the speed of the Eiszyklon RGB fan is, the 21 laser beams always remain in the same position. This is far more of an effect on the actual fan blades themselves rather than the defused looking ring around the fan that can be seen on the 120mm Alphacool Eiszyklon RGB LT. The Alphacool Eismatrix Controller can be used to create many dynamic effects. Static, Breathing, Fading, Marquee, Covering Marquee, Alternating, Spectrum Wave, Pulse and many more effects are possible using this combination. The RGB LEDs can also be dimmed via the controller. The Eiszyklon fan is connected via a 3-pin fan connector. The Eismatrix Controller is required to control the RGB lighting. Alternatively, you can also use other RGB LED controllers with an appropriate adapter. Leider sehe ich keine Angabe zur Minimal-Drehzahl. Wie weit lässt sich der Lüfter denn runterregeln? Sind die Lüfter auch mit Asus Aura kompatibel? Im Grunde genommen sind die Lüfter direkt angepasst mit dem Stecker für die Eismatrix. Es liegen dennoch vier Kabel im Stecker an, welche womöglich auf die RGB Buchse der Mainboards von Asus für die Aura Sync. passen würden. Es ist bisher nicht getestet worden, gehe aber davon aus, das es funktionieren könnte. 4 Review(s) in other languages. FInally it is so easy to setup the RGB controller. Der Lüfter macht einen sehr hochwertigen Eindruck und ist eine günstige Alternative zu anderen Herstellern.